On this show we have two heavy weights of the comedy circuit performing in Brussels, check them out! Eleanor Tiernan is an Irish comedian well-known among Irish audiences for her live stand up performances and her work in TV, theatre and on radio. She was featured on Stewart Lee’s Alternative Comedy Experience on Comedy Central and has played Latitude, Glastonbury, Montreal Just For Laughs and all of the top Irish comedy festivals. In 2010 Eleanor was one of the creators of the big hit of the Dublin Fringe Festival City West Side Story which sold out its entire run. She went on to create the innovative National Therapy Project in the same festival in 2014 for which she was nominated for the First Fortnight award. She has completed six runs at the Edinburgh Fringe festival. 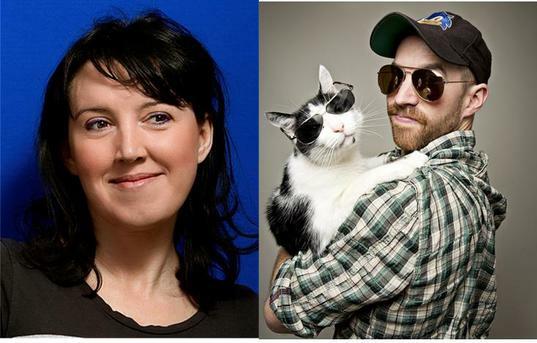 Eleanor’s first TV work was with Headwreckers as part of Channel 4‘s Comedy Lab series. Following this she both wrote and performed in RTE’s The Savage Eye which received an IFTA nomination. Eleanor has appeared on Maeve Higgins’ Fancy Vittles, The Panel, Republic of Telly and performed stand-up on Tonight with Craig Doyle. She was the first act to feature on RTE’s flagship Stand and Deliver and recently wrote and performed on the critically-acclaimed political satire show Irish Pictorial Weekly. She plays Dolores in the RTÉ sitcom Bridget and Eamonn. Eleanor lives in the UK where she enjoys making social faux pas and losing personal items on public transport. Aussie boy Damian Clark burst onto the UK comedy circuit in 2012 where his high-octane observational stand up has certainly caused some waves. Clark’s infectious energy and childlike outlook has had audiences in hysterics from the get-go and was snapped up immediately to appear on BBC3 & Comedy Central. Before touching down in the UK, Damian made Ireland his home and became regular features in RTE’s IFTA Award-winning REPUBLIC OF TELLY, comedy panelist in TV3’s THE APPRENTICE: YOU’RE FIRED! plus wrote & co-starred in I DARE YA! (‘Critics’ Choice’ – The Irish Times, ‘A Smash Hit’ – The Sunday Mirror) which became the highest rating Irish comedy debut to date. Damo’s rambunctious and uplifting stand up continues to tour clubs & festivals all over the UK, Ireland, Europe and beyond. Now is the time to catch this raw talent as he stands on the cusp of super stardom. Make sure you get your tickets in advance ! Doors open at 6:30 pm, come early and enjoy some great food and spectacular Gin & Tonics!